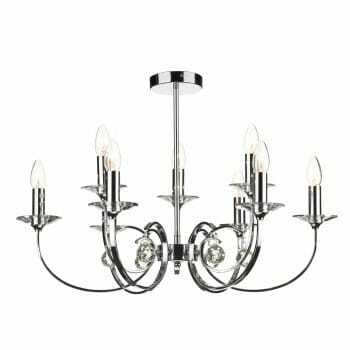 Dar Lighting Allegra 9 light multi-arm ceiling fitting features a circular design ceiling plate with central rod and chandelier style metal frame, all in polished chrome finish with crystal droppers and glass sconces. The product code for this Dar ceiling fitting is ALL1350. This beautifully designed pendant combines high gloss chrome with crystal glass decoration to create sparkling light and will be a pleasing addition to any suitable room. Height adjustable at the point of installation, comes supplied with 50cm of cable and chain and comes with a dual mount option to enable you to convert it to a semi flush fititng. The Allegra range includes a 9 or 3 light multi-arm ceiling fitting and a 2 light wall fitting which can be viewed on our website.